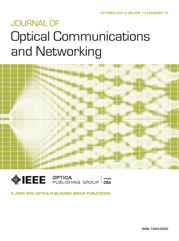 1The authors are with the Department of Electromagnetism and Telecommunications, Faculté Polytechnique, University of Mons, Mons, 7000 Belgium (e-mail: kivilcim.yuksel@umons.ac.be). An efficient monitoring method having a very short measurement time (a few seconds) is proposed. The equal-length branches can be effectively monitored, but also the information of temperature at any place in the network can be obtained. The feasibility of this technique is experimentally demonstrated.